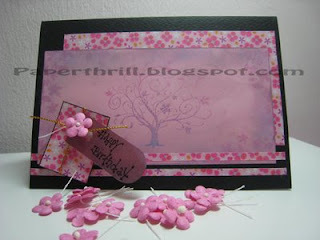 This pink themed handmade birthday card is meant for all the pink lovers out there. In order to make the pink stand out, a black cardstock was used instead as the base. The dual toned swirly autumn tree was handstamped to create a secondary focal point on the card. 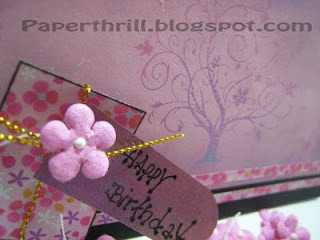 The main focal point is of course the cute little box 'present' with the birthday tag and flower tied around it. I love how the smokey effect around the tree softens the card and produce a dreamy-like feeling.